Wanted me to deploy my troops but didn't give me an edge to deploy on. Don't know why it didn't just use my guys where I'd placed them, as it did on the last two AI attacks on that sector before them. I *think* this has to do with having Arulco special division turned on. On the helicopter screen this sector shows a red helicopter. I can't destroy the helicopter on the airfield. If I move my guys around, sometimes the enemy attack will resolve; the enemy troops spawn at all of the pre-set points on the airfield though (in sandbagged positions)! This is really screwy; once you capture the meduna airfield the ability for the enemy to spawn a helicopter or elite ambush troops should be turned off! This could also be a map offset issue. For some reason when I deploy mercs in those sectors, exit the zone to load another, then come back to it, they are all offset 1 square above where I'd placed them. If I enter that sector when they get moved in to, say, a wall, or some other obstacle, it wants to reposition the troops but doesn't give any insertion points to do so. This also just happened again, in the SAM sector next to meduna airport. Except there was no battle. I just went in to move guys around and it brought me to the insertion screen! No battle ongoing. Just insta-crash. I can't even load that SAM sector at this point unless I first move the mercs to another sector and back. Here is a save taken shortly before the airport weirdness happens. might take a few reloads. Those bad guys should not be spawning there, I tried shutting arulco special divisions off. 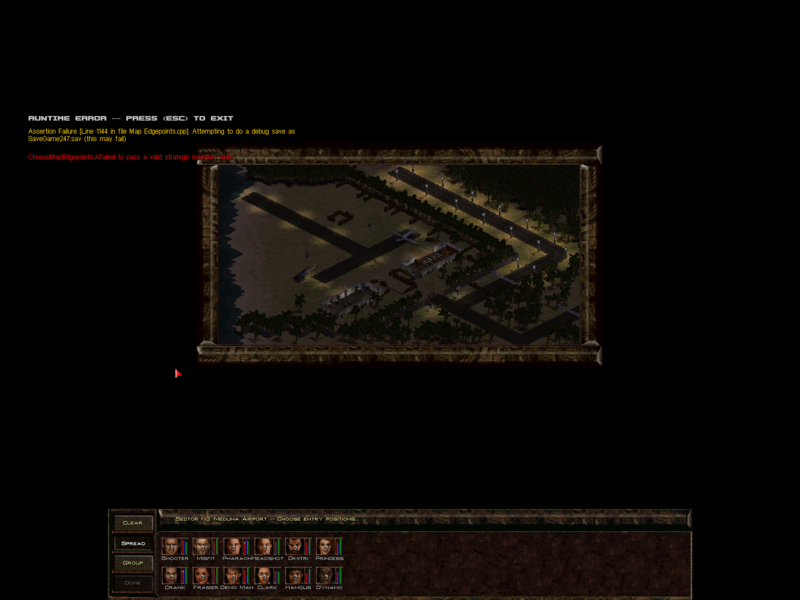 Helo stays of course and the bad guys keep spawning.